When I’ve bumped up against the occasional website snafu, I’ve always been able to pluck an answer from the help topics or the forums and fix the problem myself. Then I came up against email forwarding that mysteriously stopped. We’re talking about the service where you can take an address like info@funkycucumber.com and automatically forward it to me@gmail.com (if you’re not doing this yet for your own website, look into it! * It’s free. And it works great. Except when it occasionally doesn’t). So for hours, I tried to figure out why I didn’t get forwarded email anymore. I called GoDaddy. I fiddled with Gmail settings. I changed DNS records. I tried to understand what the heck DNS records even were. And of course I pored over the good old WordPress online help. No luck. Finally, I decided to check if WordPress had real, live customer service. That’s correct–in the better part of a decade with this company, that hadn’t occurred to me. I guess it had, but then I’d immediately wonder: Why would an entity that offers scores of free websites hire people to interact with their users? To me, looking for a “Contact Us” feature on WordPress would be like phoning Mt. Kilimanjaro for tips on how to get around a tricky boulder. To make a long story short, it worked. Beautifully. I went through a couple of hoops, found a contact form, and voila: A quick reply, from a real person with a real name (let’s call him “Brad”) and even a head shot. My new pal Brad addressed each of the points I brought up one by one. I tried his advice and it worked. Has anyone else using WordPress had trouble with email forwarding to gmail (e.g. info@mydomain.com forwarding to me@gmail.com)? If so, read on. It’s also a rare story of good customer service! My WP email forwarding stopped working recently and I was at my wits’ end to figure it out. WordPress customer service to the rescue! I got a quick and clear email back from a WP rep that solved it. Turns out you need to delete any DNS records that DON’T say “handled by wordpress.com”. I had a bunch along the lines of AXMP.L.GOOGLE.COM. Those were poo. So chuck those, and then you can set up email forwarding again, straight from WordPress. So what’s the takeaway here? Well, naturally I’m happy to share a positive customer service experience, and tell the many other WordPressers out there that the resource exists. 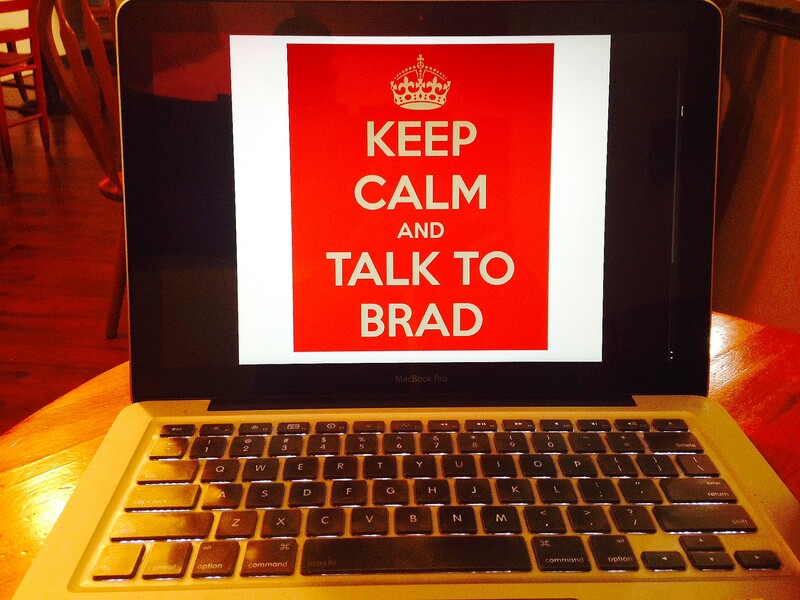 I admit that I also want to get this online, so next time someone desperately searches for an answer like I did, he or she might stumble onto this tip to ease the pain–and make Brad’s life a little easier. You can find the more personalized help options I mention above over here. Through this, you’ll either find your answer online or contact a real person. To start forwarding email via WordPress, go to Dashboard –> Store –> My Domains. Then click on “Edit Domain.” Once there, you’ll see an email setup option. The help page about WordPress email is over here. And here’s a help page about using Gmail specifically (which I’m hoping WP will update to cover what happens if you don’t pay for Google Apps, which is the case with me and I’m sure many more WP users).